These lemon-herb roasted potatoes have become one of our favorite side dishes. Made with olive oil, herbs and chicken broth, it doesn’t get simpler and so tasty. Roasted potatoes are usually loaded with a lot of butter and unnecessary hidden calories. You will be surprised how wonderful these taste and simple to make, with only 15 mins active time! The whole secret to these is to not cut completely through the potato. 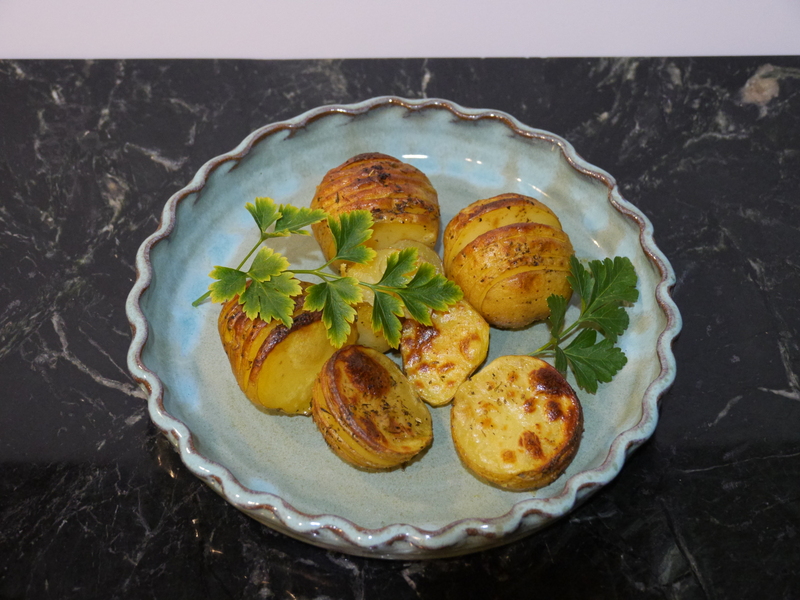 Place potatoes in a casserole with a lid and drizzle with olive oil and sprinkle with the herbs. Pour about 1/2 cup of the chicken broth in the bottom of the casserole, (more broth if you’re using a larger casserole for more potatoes). Bake covered for 30 minutes at 350 degrees. Remove lid and baste potatoes with broth from the bottom of the casserole ( this is where all of the flavor is). I baste about every 10 minutes or so, as you baste the broth gets thicker as the potatoes brown .If the broth completely is used up you can add a little more as needed. The potatoes are done when they are tender, you will know as they start to fan out more. Approximately 20 to 30 minutes after you have removed the lid. See pictures below. NOTE: Next recipe from just around the Bend is HAZELNUT CHICKEN, which pairs perfectly with my broccoli quiche recipe and Savory Herbed Roasted Potatoes.